On-board filter is made of silver impregnated coconut shell carbon. Uses only 5 amps and 150 watts of power which prolongs the lifetime of the plates. 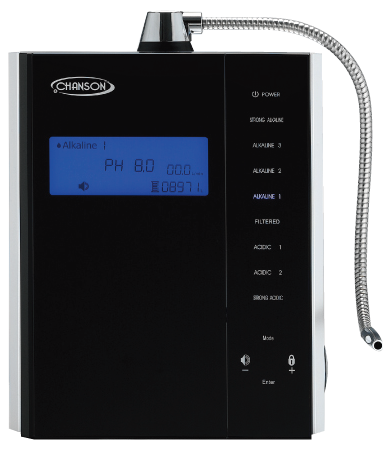 Chanson is the manufacturer and the assembler of the Chanson Water Ionizers. Chanson Water manufacturer has been in business for 30 years. Smallest counter-top unit in the ionizer industry- takes up least amount of space. Plate Size: smaller plates but still capable of making acid/alkaline water in strong and drinking ranges. Plate size does not affect ionization. Can make strong acid water in about 70% of homes in the US with no chemical alteration. Chanson has promoted pre-filtration from day number one! Toyo Tires is manufacturer and assembler of Kangen®/ Enagic brand. One of the largest ionizers takes up the most space of these three listed. Only began promoting pre-filtration after seeing Chanson. 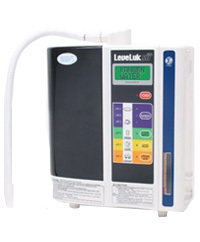 Pre-filtration only has two canisters and is $150.00. Very limited filtration capabilities. Uses only 5 amps of and 150 watts of power which prolongs the lifetime of the plates. Chanson Water Taiwan has been in business for 30 years. Larger then the Miracle, but still one of smallest ionizers on the market taking up just a little more space then the standard Miracle. Disclaimer: The testimonials, videos, articles and comments herein are the expressed opinions and experiences of the individual persons shared under their 1st amendment right of free speech. The information on this website has not been reviewed by the FDA. Products offered for sale herein are not intended to treat, cure 4r prevent any disease or health condition. No medical claims are being made. Click here to see why we must say that.